Just like the website, A Compendium of Common Knowledge 1558-1603 is packed with notes on Elizabethan food, occupations, games, and pastimes, also religion, manners, attitudes, and education—the intimate details of daily life. 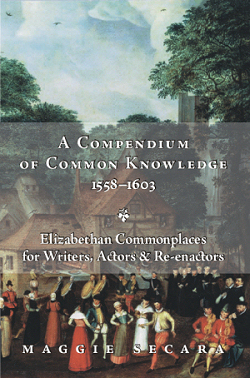 The Compendium at elizabethan.org has been used on-line for years as a unique reference for writers, students, actors, re-enactors, and Elizabethan enthusiasts of all kinds. Now you can have the whole thing in paperback! What can you do with the Compendium in paperback that you can't do online? And best of all—access it even when the computer is down! Beautifully laid out and thoughtfully edited.... An excellent introduction to the world that was familiar to the first actors of the plays. The Compendium is written with wit and humour that will joyfully carry you through the information and allow it to easily stick in your brain for easy access later. One feels as though the author is taking you by the hand and giving you her own well-informed and personal tour of the past. For bulk purchases or other international orders, email Popinjay Press. New! Find more Popinjay Press products in our online store.